Developing a new brand strategy is a key for managing how target audiences perceive you. With a goal of establishing itself as the go-to resource for safe and reliable event staff, Salima asked Parker Design to help them develop a new brand identity. Although more affordable to hire, temporary crews and event staff can pose a potential risk for those who manage conferences and high profile events. From concerts and product launches and concerts, to receptions and ceremonies, event planners rely on a range of skilled workers to meet their building, security and catering needs. The word “salima” in Arabic means “safe”, and – given that this is one of the company’s key values – the company hoped to differentiate itself in the market by focusing on the quality, experience and reliability of its event crews and on-site staff. 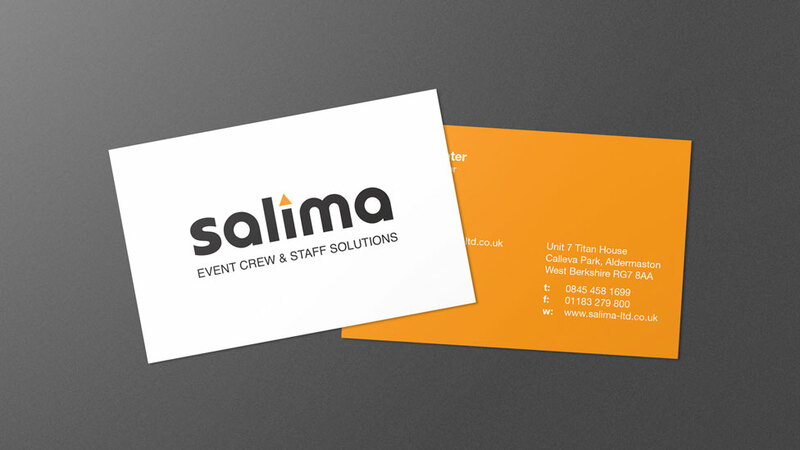 To create the look and feel that Salima wished to achieve with its new brand strategy, Parker Design came up with eight different design concepts, based on our research into the events management sector. Using orange – a colour traditionally associated with safety in the UK – as the base of our brand palette, we developed a contemporary logo, accented by silver, grey and black. Our choice of colours was intended to be both modern and eye-catching, while psychologically reinforcing the company’s brand promise. Additionally, our choice of clean, strong typography helped differentiate Salima from its competitors and further emphasise the strength and reliability of its core services. 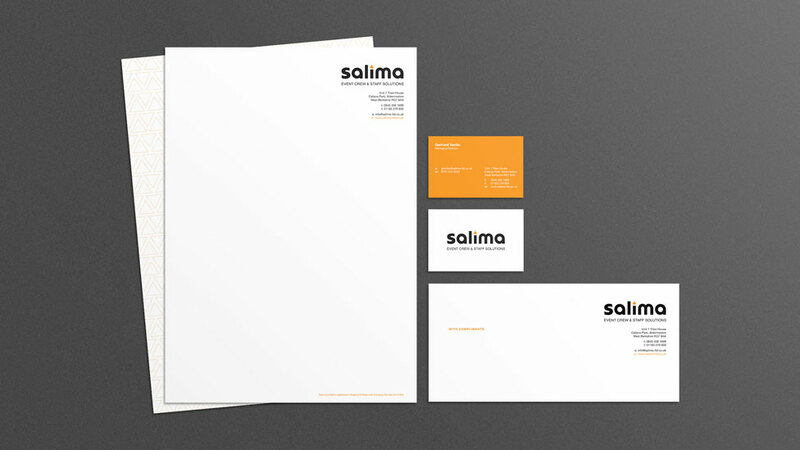 Once the logo and identity had been developed, our creative team helped Salima extend the new brand strategy to its internal and external marketing materials. In addition to providing full copywriting services to ensure the appropriate brand messages were incorporated into their collateral, we created a brochure and full suite of stationery, including letterhead, business cards and comp slips. 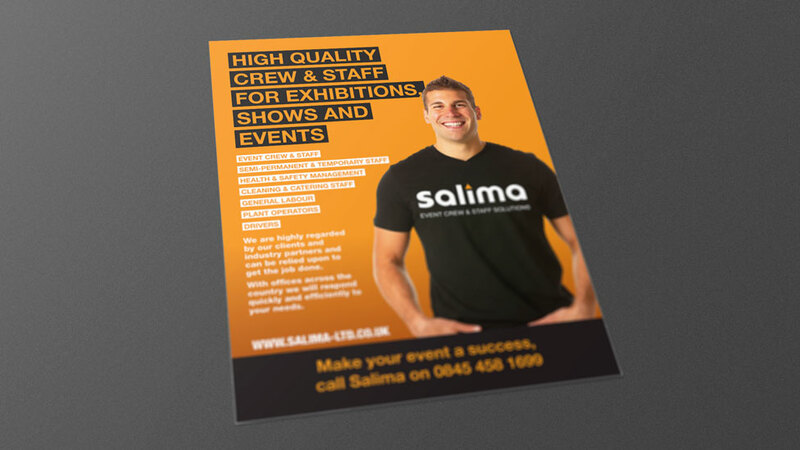 Our designers also produced a series of B2B ads for placement in directories the event trade press that focused on the quality of Salima’s skilled event teams. Good advertising needs to make a personal connection – and make it quickly – so, we developed a solution that maximised the effectiveness of the eye-catching colour palette, used photos of actual Salima crew members and developed several versions of copy, which could be changed based on the ad’s intended audience and placement. The new brand strategy was also applied to Salima’s promotional trade show materials, which were designed to build awareness, provide a straightforward call to action and be easy for their internal team to transport and use at multiple industry events throughout the year.